The lacquer finish gives the kit a great appearance which is matched by its sonic performance. The drum sizes are of the moment and the presence of Remo heads is a quality touch in the right area. A few details on the stands could be bettered, but at this level savings have to be made somewhere. The looks, sizes and sound of this kit are all spot on, and it's excellent value. Some aspects of the hardware are a little on the basic side. This kit ticks all the right boxes. The Wax Oak lacquer finish looks lovely. This V-Series replaced the previous range by the same name. The ball and socket holders execute their duties efficiently. Low mass, single-point contact lugs. The snare rustles up a crisp, sweet response. This V-Series replaced the previous range by the same name, and though its basic construction is unchanged, this kits look and feel very different. A selection of dapper lacquer finishes means that the kits immediately stand out. The V-Series is marketed globally in wrapped and lacquered finishes, but Mapex has taken the bold decision to supply the UK with lacquered kits only. It seems British punters are a discerning lot who prefer a lacquered to a wrapped kit. The lacquer choices are further distinguished by being predominantly matt wax finishes. Up until fairly recently, the prevalence of high gloss finishes meant that matt or brushed finishes, though available, seldom got much of a look in. However, understated looks are becoming more popular, so in this respect the V-Series is right on the button. Perfect timing aside, the Wax Oak lacquer finish does look lovely. The amber hue has an appealing glow about it, despite the absence of gloss, and the grain of the wood swirls elegantly beneath. Other lacquer options include Flat Black, Wax Aqua Marine and Wax Cherry Red. The sole gloss option is Plasma Black. The pursuit of lacquers further down the kit chain is amazing. The idea of a kit such as this, priced one step up from entry level, arriving with a lacquered finish used to seem absurd, but as lacquers penetrate the lower reaches of the market, the standard of finish remains high. 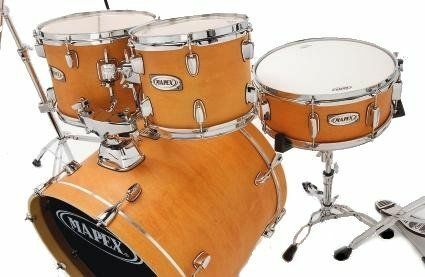 Beneath the lacquer, the shells are constructed, as before, from basswood, a common, economical substitute for maple that Mapex has used in many kits. A fair amount of it has gone into this kit; all the shells are nine plies deep and stand at a thickness of 7.2mm. Four shellpacks make up the V-Series and are mainly the usual suspects. The review kit is made up of fusion sizes: 22"x18" bass drum, 14"x5½" snare, and 10"x8", 12"x9" and 14"x11" toms. This shellpack can also be supplied with a 20"x18" bass drum. The other options are a traditional rock kit (22"x 18" bass drum, 14"x 5½" snare, 12"x9" and 13"x10" toms and a 16"x16" floor tom) and the nifty Voyager kit. Aimed at the jazz/dance/crossover drummer, it combines the snare with 8" and 10" toms, a 12" floor tom and an 18" kick. The smaller sizes of the Voyager kit make a difference to the price tag - the kit retails for £48 less than the other shellpacks. The larger kits share the same price. With the exception of the Voyager kit, the shellpacks all conform to the modern standard of short toms sitting over a long bass drum, so the toms have all lost an inch in depth, bringing them down to 'quick' sizes, while the bass drum has sprouted a couple of inches. The shells have been sanded but left unfinished inside (unlike the smooth exterior) and the bearing edges are uniformly cut. Mapex drums have always been fitted with low mass, single-point contact lugs and this is the case with the V-Series. Based on Mapex's familiar low-mass lug design, and stretched a little to resemble more of a bullet shape, the lugs are fixed with one bolt, so fewer holes are drilled in the shell, and there is less interference with the drum's tonal properties. A plastic gasket between each lug and the shell ensures a further degree of isolation. Remo heads are fitted as standard across the kit, with both bass drum heads containing dampening rings. The pressed hoops on the drums are unbranded but capable of holding their own, and indeed the tuning. Lacquered wooden hoops are found on the bass drum - again, unthinkable at this level for years. The kits are supplied with a full set of hardware: all relevant tom mountings, a snare stand, hi-hat stand, bass drum pedal, a pair of cymbal stands and a throne. Mapex's hardware has a deserved reputation for being up to the job and innovative. The ball and socket holders for the toms certainly seem no different to those found on more expensive Mapex kits, and they execute their tom-hanging duties efficiently. In comparison to Mapex's pro-spec stand ranges, it is fair to describe the stands supplied with the V-Series kits as simply functional. While strong and simple to use, they are shorn of many of the clever details found higher up the Mapex ladder. The unique rubber cymbal felts are not found here, for example. Similarly, the spring on the hi-hat stand is nonadjustable and the bass drum beater is laughably old fashioned. In their defence, the stands all sport double-braced tripods and are sturdy enough to withstand much punishment. Soundwise, the kit carries on where its appealing looks leave off. The bass drum punches out a suitably large note with casual abandon. While its dimensions ensure a deep voice, the thickness of the shell keeps it sounding taut and responsive. The internal dampeners on the heads keep the drum under control, while at the same time allowing it to breathe and sound live. The snare rustles up a crisp, sweet response with enthusiasm and no clangy overtones. Rim shots bring a further assertive edge to the sound without being too forceful or deafening. The response is good across the head and brushwork is reproduced well. The toms are delightfully clean and balanced. The number of plies involved almost eliminates any overtones - no external dampening is needed - while the short lengths contribute to their quick opening. They are not the deepest sounding toms ever made, but they deliver a sound well in excess of their price range. Neither overly toppy nor resoundingly flabby, they are easily tuned, well-rounded and just right. There is a discernible confidence within Mapex surrounding the V-Series and on this evidence it is well justified. This kit ticks all the right boxes in terms of specification and quality and represents a well thought-out package.